For an incredible fifth year in a row, Oliver Townend finishes the season as the BE Top Rider on a total of 1,531 BE Points, to again take home the prestigious Tony Collins Award. Out of his 157 starts this season, Oliver has taken 19 wins and a further 60 top ten placings, to help him amass his 1,531 BE Point total. 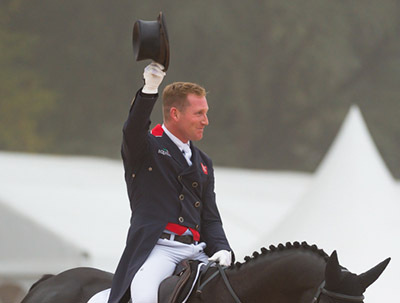 From those 19 wins, seven were secured at international level including the Land Rover Kentucky CCI4* in the USA on Mrs Angela Hislop’s Cooley Master Class and the British Eventing Seven Year Old CIC2* Championship at Osberton International Horse Trials on the Hazeldines & Mitchell Fox Group’s Weston Goodfella. Oliver also took both the CIC2* and CIC3* at Burgham International on the Hazeldines & Mitchell Fox Group’s Tregilder and Mrs Val Ryan and Mrs Angela Hislop’s Ballaghmor Class respectively. Less than 100 points behind, Izzy Taylor finished the season on a total of 1,439 BE Points to again take second place in the BE Top Rider league. A strong final run at Les 4 Etoiles de Pau in France, where Izzy placed 11th on Tom Strong’s Call Me Maggie May, closed the gap on the multiple-time league winner, but wasn’t quite enough to take the title despite their exceptionally busy season which took in 194 starts. Highlights for Izzy this season included taking both the CCI1*, on Margaret and Simon Hope’s MBF Harley Rebel, and the CCI2*, on Mrs Caroline Hurt and Miss Francesca Fitzherbert’s Conguistador II, at the Osberton International Horse Trials. Izzy also secured a win at Bramham International CIC3* on Sophie Dodds’ Be Touchable. Gemma Tattersall this year takes third place with 1,106 BE Points. Highlights for Gemma this season have seen her gaining her highest placing at CCI4* level at Les 4 Etoiles de Pau in France, where she finished in second place on Clive Smith’s Pamero 4 and helping the British team take that amazing team gold medal at this year’s World Equestrian Games on the Soul Syndicate’s Arctic Soul. The top 100 BE riders can be found HERE.